Hugs and thanks to all of you, too! We are thankful for all of our cat blogging friends, too. Happy Thanksgiving! Happy Thanksgiving to you and your humans! 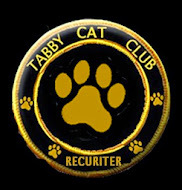 We are very grateful you are part of the kitty blogoshere, too!! Have a wonderful and blessed day! Warm wishes from all of us at Zee & Zoey's! You're special to us, too! Happy Thanksgiving! We are thankful for you as well!!! Hope you had a wonderful thanksgiving! You are all so sweet...and handsome...and beautiful. Happy belated Thanksgiving to yous and yours from us and ours! And thank YOU for such a kind and thoughtful post. We join you in being thankful for our blogging friends. Thank you for visiting Kizzie's blog. She lives in England and, although we don't have thanksgiving there, she also has a lot to be thankful for.